A Southern Independent Booksellers Association Book Award nominee! 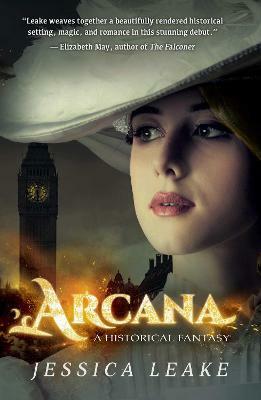 A romantic, suspenseful, genre-bending debut set in Edwardian London. Amid the sumptuous backdrop of the London season in 1905, headstrong Katherine Sinclair must join the ranks of debutantes vying for suitors. Unfortunately for Katherine, she cannot imagine anything more loathsome or dangerous. To help ease her entrance into society, Katherine's family has elicited the assistance of the Earl of Thornewood, a friend and London's most eligible bachelor, to be her constant companion at the endless fetes and balls. But upon her arrival in London, Katherine realizes there will be more to this season than just white gowns and husband hunting. Through her late mother's enchanted diary, Katherine receives warning to keep hidden her otherworldly ability to perform arcana, a magic fueled by the power of the sun. Any misstep could mean ruin and not just for her family name. The Order of the Eternal Sun is everywhere hunting for those like her, able to feed on arcana with only a touch of the hand. But society intrigue can be just as perilous as the Order. The machinations of the fashionable elite are a constant threat, and those who covet Katherine's arcana, seeking the power of her birthright, could be hiding behind the facade of every suitor even the darkly handsome Earl of Thornewood. Jessica Leake is a debut writer who blogs about family, friends, and writing at jessicaleake.com. She used to be a psychotherapist, but has shifted her priorities to her family in recent years. She resides in Greenville, South Carolina, with her husband and three young children.